What do we have to look forward to this coming year of 2015? I’m sure all of you are very excited about November’s announcement from the city to invest in a major renewal project for Fairmount Park. The “Return to Fairmount Park” project will be a nearly $1 million project over the coming year. We want to recognize that this is being made possible, in part, by a $100,000 lead donation from the Rotary Club of Council Bluffs as their celebrate their 100th year of service. Once considered the greatest park in the area and a regional destination, Fairmount Park has a history of being one of the premier parks in the country in the early parts of the last century. It featured a greenhouse, ice-skating, sledding, a petting zoo and an old bell tower. Council Bluffs’ trolley streetcars once had a stop at Fairmount Park. You can find further details on the project at the link below. Neighborhood Association representatives met at the Neighborhood Center (136 South Main) to publicly refute the Nonpareil article and the NeighborhoodScout.com online report about ranking Council Bluffs the 56th most dangerous city in America. Those present included City Councilmen Nate Watson, Dan Rhodes President of Kainsville-Tinley Neighborhood Association, John Marshall Vice President of North Broadway Neighborhood Association and myself as President of the Farirmount Park Neighborhood Association. I’ve included the link to the Nonpareil and KMTV news story. I encourage everyone to read the article and review the broadcast to form their own opinions. The Fairmount Park Neighborhood Association has been selected as a finalist for the 2014 Neighborhood of the Year (NOTY) award. Back in February we submitted our FPNA Pole Project as our entry to the 2014 Neighborhood of the Year (NOTY) awards. The 2014 NOTY awards from Neighborhoods USA (NUSA) marks the 30th year that NUSA will recognize the outstanding work of neighborhood organizations across the United States for their work in improving the quality of life in their communities. Our entry was in the Physical Revitalization/Beautification category. Entrants were judged on Self Help/Financial Capability, Grassroots Involvement, Innovativeness, Community Benefit, Sustainability., Leadership Development , Partnership Building , Volunteerism and Ability to be Replicated. The winners of the 2014 NOTY will be announced on May 22nd. at the 2014 NUSA conference in Eugene, Oregon. This is the annual conference of Neighborhoods for the United States. I want to thank all of our FPNA volunteers who have worked on our Pole project from writing grants, creating budgets, digging holes, erecting poles, hanging banners, planting flower baskets and constructing decorations. Your time, energy and effort is greatly appreciated. The installation of the FPNA identification banner poles has been a long-term goal of ours that is starting to come to fruition. Back in 2009 we participated in a design Charette with the Iowa Architecture Foundation (IAF). While there were many good ideas from the IAF the banner/pole/flower basket seemed to catch everyone’s attention and that is what we chose to focus on. It has taken a few years to reach this point. We first needed to build up our treasury while still undertaking other improvement and beautification projects around the neighborhood. We remained frugal because we always knew what the end goal needed to be. We are now seeing the first phases of this project complete. 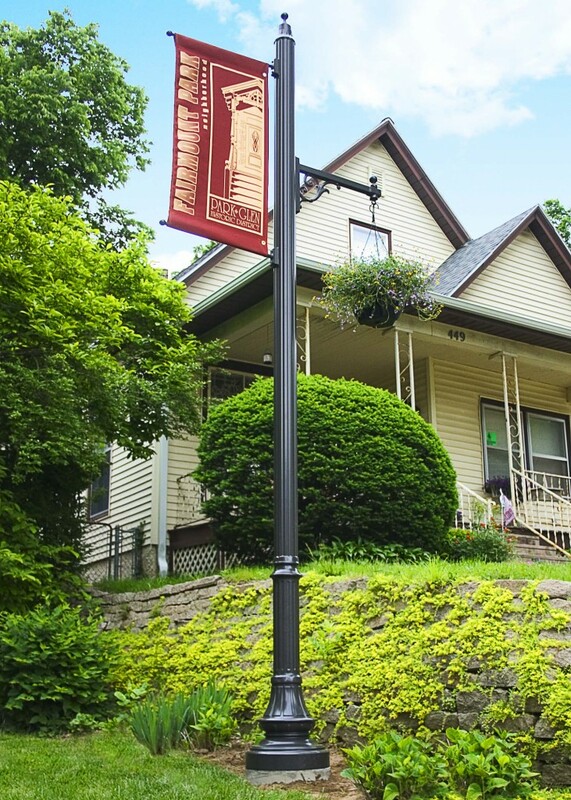 We have poles/banners and baskets installed at the entrances to our neighborhood that will help strengthen a sense of belonging and empower neighbors to actively participate in the neighborhood and the community. Both organizations were very gracious about the delays in manufacturing and the weather conditions that caused us to be behind schedule. The FPNA very much appreciates their continued commitment to helping organizations like ours achieve the goals we set for ourselves, our neighborhood and our community. I want to thank the grant writer – Sharon Babbitt, who poured over the applications and helped communicate our intent in the best possible terms. To the installation crew, Dave Huggins and Mike Ring and myself who dug, poured concrete, set anchor bolts, got muddy, got drenched but persevered to make it happen. To Michelle Mutchler-Burns, who will be the care taker of the flower baskets so that they continue to inspire and impress all who visit our neighborhood. This is only the first phase, we have more installation locations planned so the hard work isn’t quite done. But now that we kinda know what we are doing it might not be so painful. Thanks again to everyone who has participated over the years on this project. For photos from the installation “CLICK HERE”. Posted: Sunday, January 13, 2013 12:00 am | Updated: 2:39 pm, Tue Jan 15, 2013. So do Council Bluffs officials. Efforts are being made to develop a vacant stretch in the Park/Glen Neighborhood with homes to fit the historical characteristics of that area. Officials have just sent requests for proposals to potential developers to build at least four single-family homes meeting certain historical characteristics in the 400 block of Park Avenue. Proposals are to be returned to the Community Development Department no later than March 1, said spokeswoman Brenda Carrico. “You always hope for a good response,” she said. Over a period of time, the city acquired titles through the court system to the properties located at 401, 409, 431, 435 and 441 Park Avenue. Efforts to seek improvements on those houses were unsuccessful. “We boarded them up for years,” Carrico said. A study last year found renovation of the homes there was financially unfeasible, she said. Five structures were recently demolished. One of the city’s objectives in redeveloping that property is building residential structures consistent with the historic character of the immediate area. The Park/Glen Historic District is listed on the National Register of Historic Places. Gross said other cities have probably done a similar project, but the actions here are not modeled after any outside models. Carrico described the neighborhood’s character as being in the late 19th Century Victorian style with homes being at least two stories and featuring a wrap-around porch and gable-type roofs. “I think they are on the right track,” said John Jerkovich, a local developer. Many so-called in-fill homes, those being built in the heart of the city, are two-story structures, he said. Gross doesn’t think the historical requirements will be difficult for developers. “We don’t believe so. Constructing a two-story structure with a gable roof and a front porch would go a long way at matching the scale, density, and character of the neighborhood. It’s not a question whether builders can build homes at this location. We have many qualified and capable builders in this community. The question is, can they sell the homes? The six lots have been appraised for $67,700, which equates to $11,283 per lot, according to Gross. At least four structures have to be built to qualify for Enterprise Zone tax benefits that encourage development, Carrico said. Based on financial needs, the city will consider various options on the sale of the land. In addition, property tax abatement may be available for eligible housing projects. “We’re willing to participate financially in projects based on needs,” Carrico said. That’s good, according to Jerkovich. “We assume that the need to build the homes to fit the historic nature of the neighborhood could have some costs, but not to an amount that would make the project unfeasible,” Gross added. Following the March 1 deadline, she and other department officials will recommend a developer to the City Council at its late March meeting, Carrico said. With approval, the chosen developer would have two years to complete the project, she said. If for some reason there aren’t any takers for this project, the city would wait and try again when market conditions improve, Gross said. Nevertheless, there has been interest already, he quickly said. “I think it will be OK,” Jerkovich said.